Lot of users create fanpage on Facebook to promote their blog, website, brand or personality among Facebook users. By default, ‘wall’ tab contents are displayed when any Facebook fanpage is opened. Incase you have added tabs with more interesting content like Twitter & Youtube video tabs on fanpage – then you can change the default ‘wall’ tab with more interesting Twitter, Youtube or any other tab on your Facebook fanpage. 1. After Facebook login, click on fanpage name on left sidebar to open its default page. Alternatively, you can click down arrow at top right and click use Facebook as page option. Then click on fanpage whose default landing tab you want to change. 2. On fanpage, click Edit Page button at top right part of the screen. This will open Settings page for your fanpage. Under ‘Manage Permissions’ tab look for ‘Default Landing Tab’ option. 3. Select the tab from drop down box next to ‘Default Landing Tab’. Options include: wall, info, friend activity, photos, questions and other tab options like Twitter, Youtube tab on fanpage as a result of installed apps. 4. Once you select specific tab, click Save Changes button at the bottom. Then open your fanpage again, now it will display newly selected tab as default instead of ‘wall’ tab. 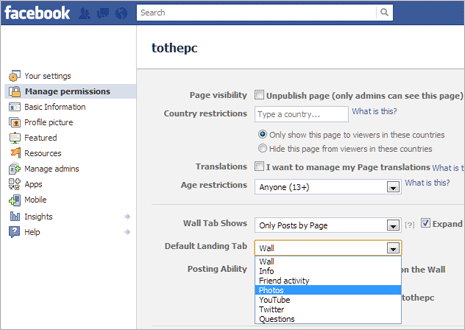 This option is very useful when you have created welcome page tab for your fanpage. You can configure to open welcome page tab to all users who open your Facebook fanpage.